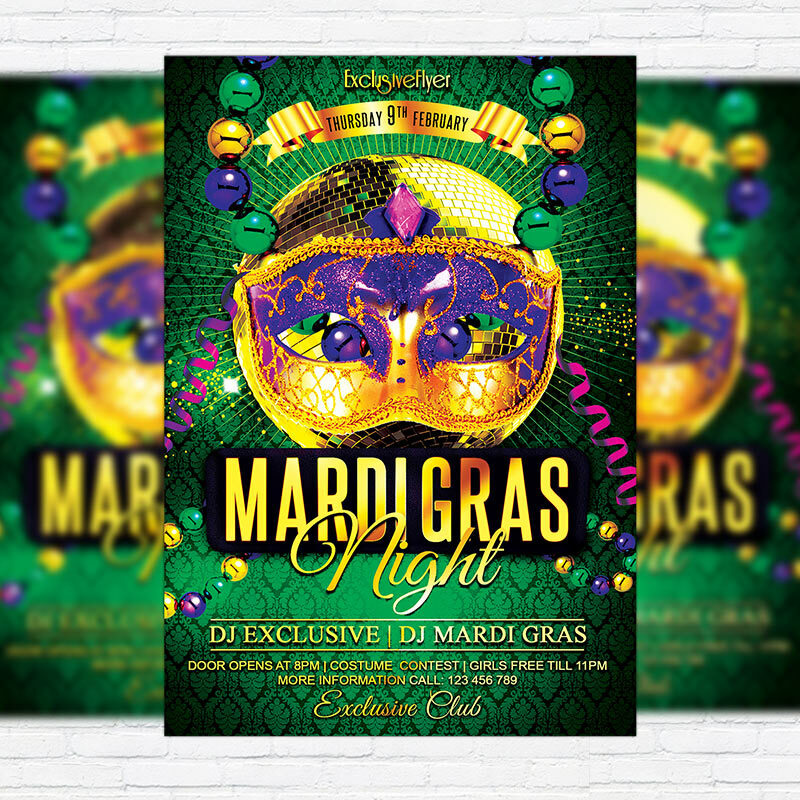 The Mardi Gras Nigth is the exclusive Photoshop PSD flyer template designed by ExclusiveFlyer to promote your Mardi Gras Night. SKU: 0.737. 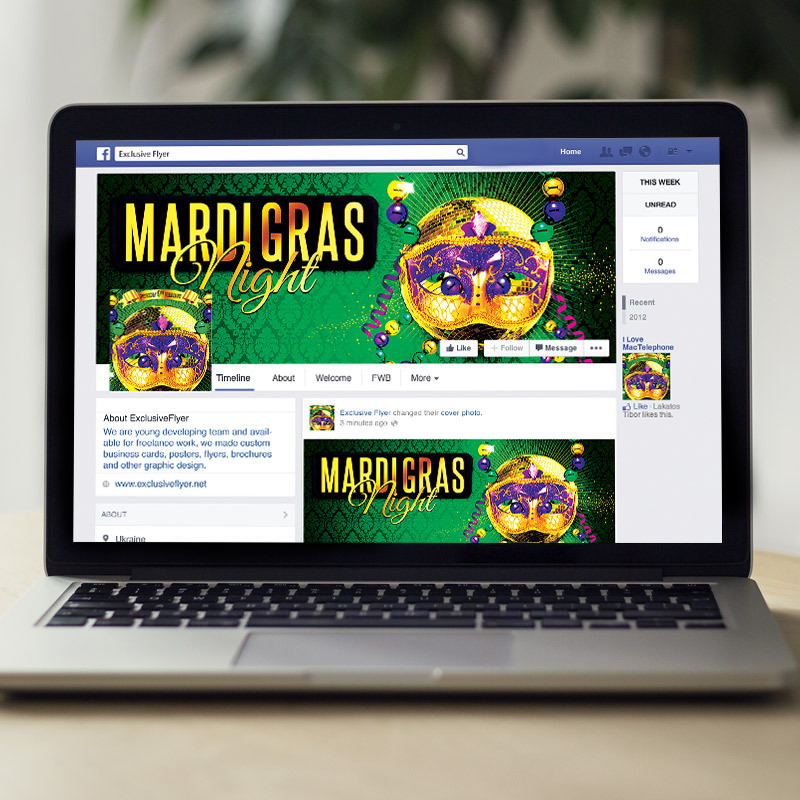 Categories: Mardi Gras Flyers, Seasonal Flyers. Tags: beads, brazillian, carnival, carnival flyer, celebration, Costumes, fat Tuesday, feather, festival, fiesta, green, halloween, holiday, king, mardi gras, mardi gras flyer, mask, masks, masquerade, St Louis. 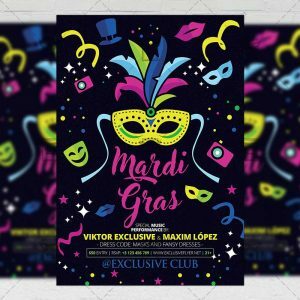 The Mardi Gras Nigth is the exclusive Photoshop PSD flyer template designed by ExclusiveFlyer to promote your Mardi Gras Night. 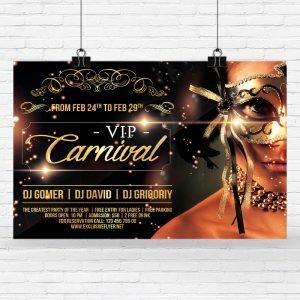 This is a modern, stylish flyer and just be used for a Carnival Night, Mardi Gras Party or Venecian Carnival etc. Dear customers! – you can also: Customize any flyers or Hire Us to create any unique product. Also, you can get unlimited access to all our templates. You can buy 1 month membership, 3 or 6 months membership or even 1 year membership plan and login on site, choose a design, click the button DOWNLOAD TEMPLATE and it’s yours. No hassle, no checkout! When you paid the template, you can find it in your personal account and of course you’ve got a message to your e-mail (maybe in spam) with link to download. Also, you can find all templates, which you buy, in your personal account! All of our flyers have a very good quality (300DPI). And it means that you just need to download one of them and make the necessary modifications such as replace the elements or choose the colors and start to invite your guests! You can order from us design of Banner Ad, Bi-Fold Brochure, Tri-Fold Brochure, Business Card, Logo, One-Sided Flyer, Two-sided Flyer or Postcard. All you need is to checkout and write us all information on our e-mail or skype. (order now). There are a lot of free flyer templates, free business card templates on our site! Also there are a lot of categories of flyers such as club flyers, seasonal flyers, sport flyers and also business flyers. You have a great choise on our site, so good luck! Don’t forget to follow our Facebook community, our page on Twitter, on Pinterest and on Tumblr and leave comments, cause we work for you! PSD is set up in 1275×1875 dimension (4” x 6” with 0,25” bleed). The PSD file is very well organised, with color coded groups and layers named appropriately. Remember, all stock images of models and other people used only for demonstration all charms of the flyer and don’t included in the download! 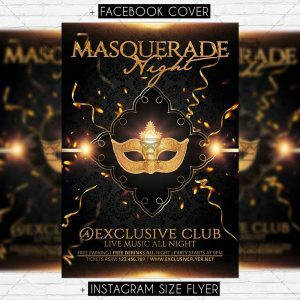 The Masquerade Ball Party is the exclusive Photoshop PSD flyer template designed by ExclusiveFlyer to promote your Masquerade Ball Party. 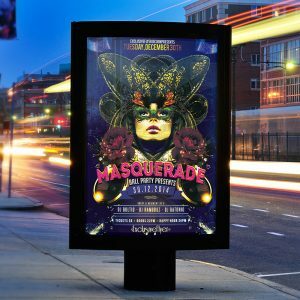 This is a modern, stylish flyer and just be used for a Masquerade Night or Ball Party. 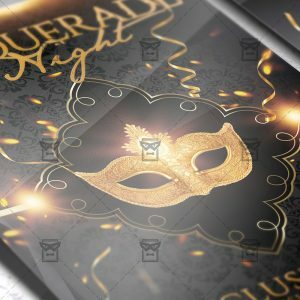 The Masquerade Night is the exclusive Photoshop PSD flyer template designed by ExclusiveFlyer to promote your Masquerade Night. 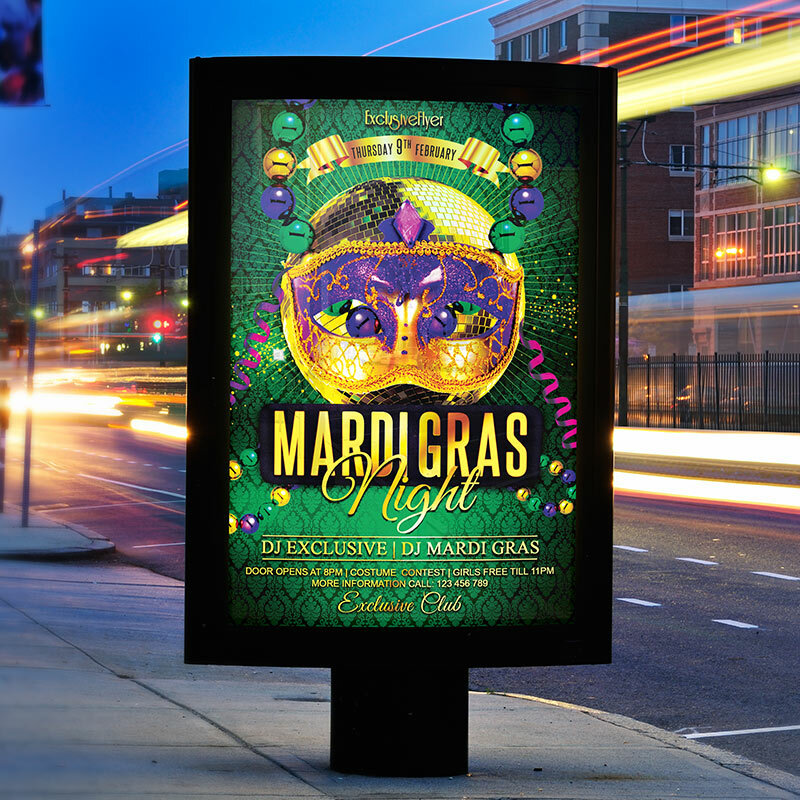 This is a modern, stylish flyer and just be used for a Masquerade New Year Night, Mardi Grass Party etc. 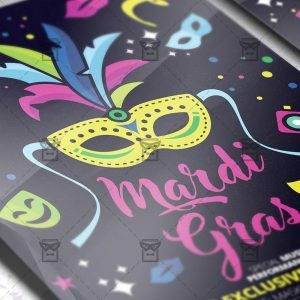 Mardi Gras Celebration is an exclusive PSD flyer template for Adobe Photoshop designed by our best graphic designers to facilitate your task in promoting your business. 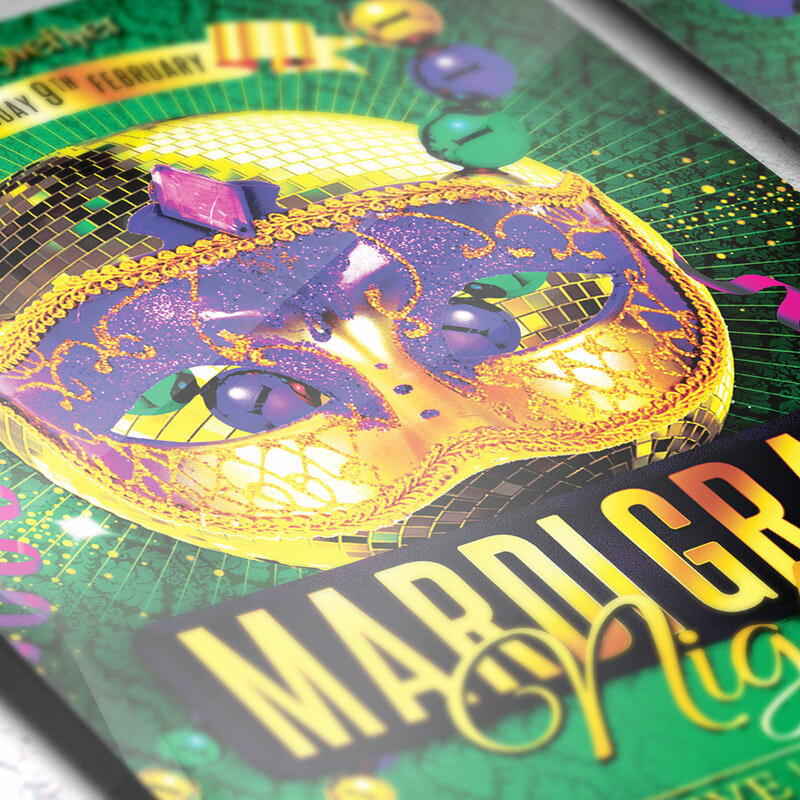 With our readymade Mardi Gras flyer in psd format you can invite you customers and guest to your event or to the best Mardi Gras Celebration Event, Carnival Night, Mask Party or Costume Party in their lives. 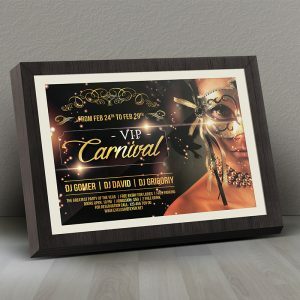 The Vip Carnival is the exclusive Photoshop PSD flyer template designed by ExclusiveFlyer to promote your Carnival Night.